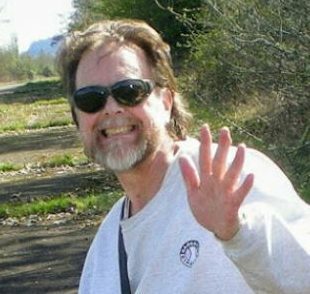 William Wayne Baker, beloved partner, brother, uncle, step-father, step-grandfather, cousin and loyal friend, lost his battle with brain cancer on December 4, 2018 at Salem Hospital, in Salem Oregon. Bill was 64 years old. A memorial service will be held at 1 pm Saturday, February 9th at the Johnson Funeral Home, with a reception immediately following. Bill was born December 21, 1953 in La Crosse, Wisconsin to Keith Wayne Baker and Helen Wilhelmina Johnson Baker. In 1955, when Bill was 2 years old, he and his family moved from Wisconsin to San Bernardino, California for a warmer climate to help him recover from pneumonia. Bill attended kindergarten and first grade at Muscay Grade School in San Bernardino. In 1961, after Bill no longer had health issues, his family moved back to Minnesota/Wisconsin where the family had lived originally. He split his second grade year between Redwing, Minnesota and Hokah, Minnesota Grade Schools. Bill continued in Minnesota schools through his junior year in high school. When his father died suddenly, the family moved to Colton, Oregon. During his senior year at Colton High School, Bill created an independent study psychology class (foreshadowing one of his bachelor’s degrees), was the president of the Spanish Club, was on the Prom Court, sang in the choir and was an active member of the Pep Club. Bill graduated from Colton High School in 1972. After high school, Bill attended Southern Oregon State College in Ashland, Oregon. He graduated in 1978 with two bachelor degrees: one a Bachelor of Science in Psychology with a minor in Business, and the other a Bachelor of Science in Social Sciences with a minor in Economics. While in college, Bill married Roberta O’Dougherty on July 31, 1976, and divorced in 1983. For nearly two decades, Bill lived in Bend, Oregon, where he started a waterbed business, in which he designed, built and sold custom waterbeds. Additionally, he built a vacation home, which he rented to skiers in the winter. He worked for Beaver Coaches for several years, delivering motor homes all around the US and parts of Canada. He was a licensed contractor, who painted numerous homes and remodeled or rehabbed many houses over the years. Bill met LaDonna Macomber in 1988 at a Valentines party at the Elks Club, in Bend Oregon. Instantly, the two found they had so much in common and thoroughly enjoyed each other’s company. They have been inseparable ever since and have been together for 31 years. LaDonna was his primary care giver and champion during his battle with brain cancer. Bill was a man of many strengths and interests: an outdoor enthusiast, who loved hiking, biking and cross-country skiing. He was an entrepreneur, a mentor, a student, a teacher, a pilot, a builder, an actor, and a wanna be ballroom dancer. He was a natural handyman and could fix just about anything. If he didn’t know how, he’d use his intuitive engineering skills to figure out the most efficient way to do the job. Bill had a zest for life. He was known for his sense of humor and enjoyed entertaining the crowd. He was curious, creative, spontaneous, and always ready to go on an adventure, big or small. Bill was known for coming to the aid of family and friends. He provided advice about when to sell various houses, served as a father figure when one was absent, taught nieces how to drive, built fences and decks for family, diagnosed a leaking roof or a bump in the middle of the kitchen floor, fixed complicated auto repair issues, and ensured that all friends and family had a decent and economical car to drive. Bill was praised as being the most reliable and trustworthy friend, an amazing human, a great listener, a gentle giant, as always being there for others, and simply put self-less. He treated everyone with dignity and unconditionally accepted all people he met, including those down on their luck needing work. Bill lived in many places through his life, from Wisconsin and Minnesota to California and back; From Northern Oregon to Southern Oregon to Central Oregon to Salem. He loved vacationing and traveled many places for pleasure, as well. He loved going to the mountains and forests, to the desert, to the ocean beaches, to the lakes; To quaint little towns, to the glitz of big cities. He loved Hawaii and his college town, Ashland, and went both places often. To name only a few, he especially enjoyed New Orleans, Key West, San Francisco, San Diego, and Savannah. He loved LaDonna’s family history trips across the US and to Ireland, and took great advantage of the opportunities to travel during his motor home delivery years. When traveling, he equally enjoyed living among the townsfolks frequenting the local hangouts, and being a tourist sightseeing the famous hot spots. He is survived by his life partner LaDonna Macomber, his four siblings and their spouses: Judy Ann Baker and children: Julie Wirth and Jamie Wirth and families; Ruth Eileen Keyser and Glen Keyser and family; Roy Wade Baker; and Steven Allen Baker and Debbi Baker and family; his step-daughter Nicole Macomber and step-grandson Tane Hansen; his nephew Scott Mollenhauer and Joy Mollenhauer and family; his niece Pam Mollenhauer and children: Michael and Gerri Nodine and family, Melissa and Bradley Parkinson and family, Joshua Miller, and Breanna Gonzalez; his niece Donna Labriola and children; his niece Debbie Mauk and David Mauk and children; and numerous cousins, great nieces and nephews. Bill was preceded in death by his parents, Keith Wayne Baker and Helen Wilhelmina Johnson Baker. Bill was a kind and gentle man. He had the most amazing sense of humor. I am really glad to hear he had a full and happy life after we parted. The world is a sadder place without him. My regards to his family and friends. Bill was a delightful, kind human being. I am heartened to hear his life was so full and rich since we parted. I am truly sad that this gentle spirit is gone. The planet is a darker place without him. Thank you Steve. Terry and Amber. Bill was one of my Best Friends in High School at Wabasha, MN. He was also my neighbor in Kellogg, MN. We shared a lot in common. Camping, Canoeing and warm companionship were enjoyed. Bill was brilliant as a student and excelled in his studies. Through thick and thin we were buddies. And then he moved away and we lost track. I was so sad to hear of his passing and extend my greatest sympathies and condolences to his family. Thoughts and Prayers go out to all of you. May God Bless and Protect Bill Baker-Forever. My deepest sympathies for your loss. I met Bill when he was my neighbor back in Kellogg, MN (late 60’s early 70’s). As mentioned, he did make it a point to visit us in his travels, very much appreciated that he did that. Sorry to hear he has passed away. Thoughts and prayers go out to his loved ones. Roy, Steven, and LaDonna, I pray for you moving forward. My condolences to LaDonna and rest of the family and friends.I enjoyed reading the nice story of Bills life, thank you for sharing. May Bill rest in peace and may all of his family and friends find comfort at this difficult time. Thank you for trusting Johnson Funeral Home.